**if you are here for the Running Times Deal see below. Saturdays are one of my more difficult days to get a run in. During the week I always run before work leaving anytime after 5:00 am, and Sundays I like to get my long(er) run in before church and leave usually before 6:30 am. Lately these Sunday morning runs have been with my daughters which has been awesome! During the training for my marathon I was getting up even earlier during the week and on Sundays to get my longer runs in. On the Saturdays when we have nothing else going on we like to sleep in later (see previous paragraph) and then have breakfast as a family. This is something we have done for years whenever possible and we all really enjoy this time. Of course an early run for me means I am messing with this family tradition which I love just as much as everybody else. Following a breakfast like these usually are, we cannot hit the road anytime soon so the 2 hour rule is in effect for digestion purposes. Saturday's just seem to go from there and never slow down, they usually include yard work, picking up around the house, house repairs, as well as a multitude of other things. These days never seem to slow down and go from one thing to the next. As the day goes, so does the time, and next thing I know it is nearing dinner time and I usually have not gotten my run in. I really prefer to run earlier in the day and this makes me less than pleasant to be around. There are many reasons why this ends up being a problem. It is usually hotter out, I am tired from the physical work of the day, it messes with everyone else's schedule, and also the fact that I will be running a long(er) run early the next morning. So, how do you work your run in on Saturday? Do you have any routines that just help your running click, or do you also struggle with scheduling your runs on Saturday? 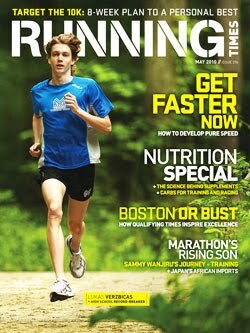 Discount Mags is currently running a deal to get Running Times for only $3.50/yr. I don't know how long this deal will last, but to get it just go here and then enter 4873 for the code when checking out. I was able to renew my subscription for 4 years for only $14. Thanks to Dealspl.us for this deal. I intentionally leave my weekends free for working out. I wish I could get in my workouts in the morning on the weekdays but I can't seem to wake up early enough to do it. I tried for awhile to take up between 4:15 - 4:30 (I have to be in the shower by 5:45 am to make it to work on time) and I just couldn't keep it up. I truly admire people who can workout first thing in the morning. It is not always easy to get up and workout in the morning. The key for me is to get to bed early enough. I love getting my runs done in the morning if I can, I feel like I'm ahead of the game for the rest of the day. Very cool that you run with your daughters, I'm hoping my kids will do that with me someday! Yes, I sometimes find that fitting the runs in on the weekends can be challenging. It is hard with balancing my kid's activities and just all of the other stuff that needs to get done. I am most likely going to have to start getting up early to get my runs in. I personally feel that I run better in the evening. Maybe my body will get used to it:) It better get used to it because my marathon training starts next week! I am thinking about running twice a day to get my higher miles in:) Thanks for the tip on the magazine. You are lucky that your girls will run with you. I am attempting to get my daughter to run with me:) Hopefully one of these days she will come along.